Blog home / Everything CBTN / Networking Basics: What is MPLS? The Quick Definition: Multi-protocol Label Switching (MPLS) is a protocol-agnostic routing technique designed to speed up and shape traffic flows across wide area- and service provider- networks. 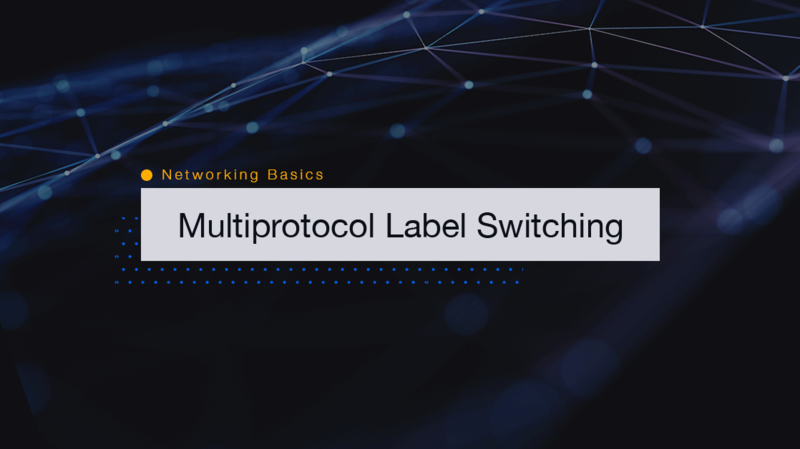 Multi-Protocol Label Switching, or MPLS, is a way to connect your sites together. If you choose to use VoIP solutions across a wide area network, you probably will incorporate MPLS. Previous techniques used to broadcast voice communications became inefficient as networks grew. And of course, the cloud became a part of internal communications. MPLS makes it much more efficient for organizations to send voice over the internet without poor connections and dropped packets. Let’s explore how it works more in detail. Take Customer A, who has a site with a switch and a couple of PCs connected. They have an IP phone connected and they want to bridge that over from Site A to Site B, which is a thousand miles away. They’ve also got a router and switch connected to their computer. MPLS bridges the sites together through the service router’s cloud on a private tunnel. This way, they have their own private connection going through that cloud. With MPLS, you can bridge all of these sites together. Think a full mesh where all sites become connected. The cloud is yours, and you can set it up — just like a shared connection. It’s like a big switch. You can have all these sites connected, plugging into this giant switch, and they can all communicate. Being able to connect to any kind of connection type that the service router supports is a huge benefit. Before MPLS, you had to buy a T1 line to connect sites. If you wanted to add another site, you had to link it from site A to the T1 line that went to site C. But site C had to go through site A to site B. Now, you have one site that can communicate to many other sites. The provider and your internal engineers can set up a telecommunications network in a mesh pattern. As opposed to old-school setups that required routing across specific subnets before each communication packet reached its destination. Your network and providers can also use different speeds to connect to the mesh network. One location could use slower T1 lines (1.54Mbps), while another location could use fiber connectivity. The result is a seamless mesh network that works together — regardless of the underlying network speeds. People typically bring their connections together via the internet. They have connections at each of their sites and use VPN technology to connect those sites. VPNs add extra header information — to the tune of adding a ton of header for the encryption to support the encryption to each one of the packets that go across between your sites. This isn’t good for voice over IP (VoIP). Is it possible? Yes. Can you do it? Yes. Will you get bad calls? Yes. How many? Depends on your service provider. So it really becomes voice over IP over VPN. But when you use MPLS, you can tag your packets with specific markings. Some people call them TOS, some people call them DSCP. The service routers then translate them into MPLS labels. This provides a higher Quality of Service (QoS), a metric used to determine the amount of time needed to transport data and the number of poor packets that run across the network. Quality of service is an important metric when you work with VoIP processes. Simply put, it measures your ability to have a conversation with another recipient without dropped packets, static, and downtime. Service providers now have the ability to tag the packets with MPLS labels. Imagine shipping something between two locations. What if, at every single stop, the shipping company had to open the box up and look at what’s inside to figure out where it’s going? This is bad for two reasons. First, it invades your privacy. Secondly, it takes much longer to transport packages if every one of them must be opened before determining its route. Instead, you just put a label on the box one time that says, “This is the destination.” As it goes from site A, to site B, to site C of FedEx or UPS or whichever shipping company you’re using, they just check the label. No one has to open the box until it arrives at its destination. The service provider can stick an MPLS label on the packet as it comes into the cloud. That label tells them exactly where it’s going. There are even these things called experimental bits, which is a way of translating quality service tags into that label so that they can tell just by looking at Layer 2 (the lowest layer in the OSI model you can actually put data at). It’s a label on the outside of the box, so they can be really efficient in sending that thing through the cloud without looking at Layer 3 or Layer 4 QoS data. Or opening the package, if you will. MPLS replaces old technology that relied on routing tables and frame relay protocols. It’s commonly used in private networks. It’s also implemented by your internet service provider. It’s faster, more efficient, and works at lower OSI model layers. If you plan to use any VoIP solutions, you will probably use MLPS technology.